(GeoPark, 5.Feb.2019) — GeoPark Limited announced its independent oil and gas reserves assessment, certified by DeGolyer and MacNaughton Corp. (D&M), under PRMS methodology, as of December 31, 2018. All figures are expressed in US Dollars. 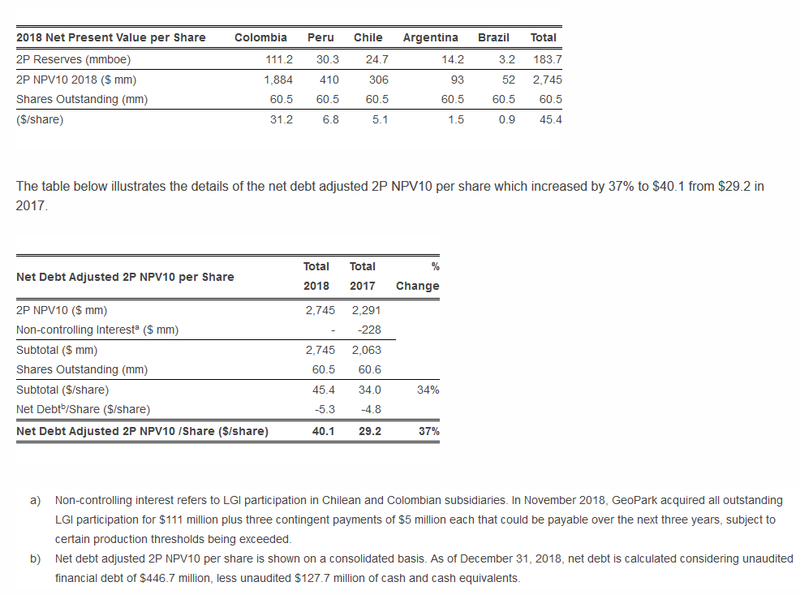 The table below presents GeoPark’s net present value after tax and non-controlling interest, discounted at a 10% rate per share, by country, of 2P reserves as of December 31, 2018 and 2017. GeoPark engaged D&M to carry out an independent appraisal of reserves as of December 31, 2018, covering 100% of the current assets in Colombia, Chile, Brazil, Peru and Argentina. 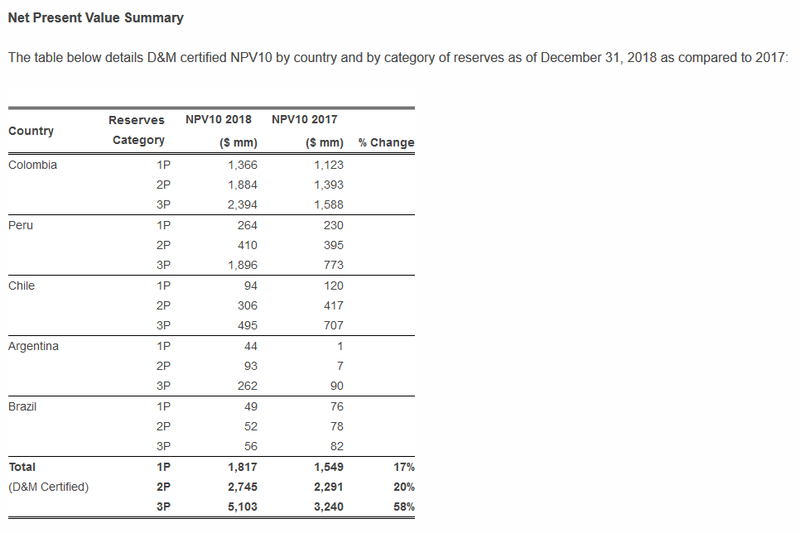 Following oil and gas production of 13.2 mmboe in 2018, D&M certified 2P net reserves of 183.7 mmboe (85% oil and 15% gas) as of December 31, 2018. 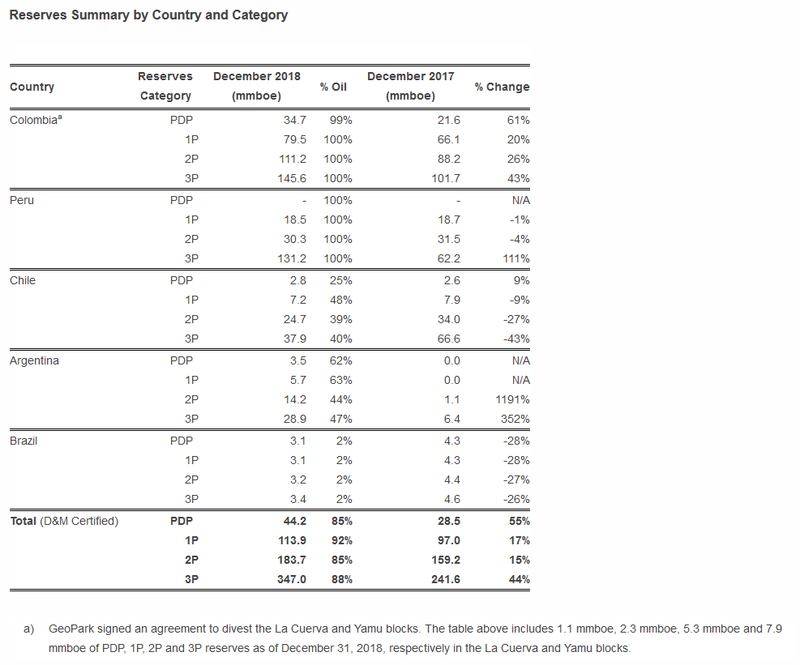 By country, the reserves were: 61% in Colombia, 17% in Peru, 13% in Chile, 7% in Argentina and 2% in Brazil. After record production of 10.8 mmbbl in 2018 (an increase of 30% over 2017), GeoPark’s 2P D&M certified reserves increased by 26% to 111.2 mmbbl compared to 2017. Net additions of 33.4 mmbbl of 2P reserves resulted from strong reservoir performance and continued successful exploration, development and appraisal drilling in the Llanos 34 block (GeoPark operated, 45% WI). For each barrel of oil extracted in Colombia, GeoPark added 2.3 barrels of 1P reserves, the equivalent of a 1P RRR of 229%. 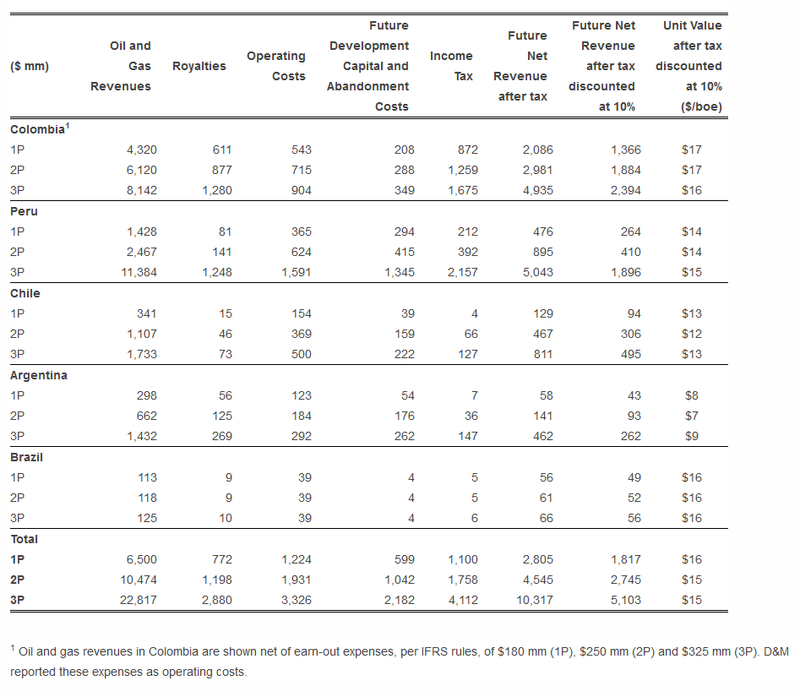 Similarly, for each barrel of oil extracted, GeoPark added 3.2 barrels of 2P reserves, resulting in a 2P RRR of 321%. The 1P RLI was 7.6 years, while the 2P RLI was 10.7 years. As of December 31, 2018, the Llanos 34 block included approximately 80-90 future development drilling locations (2P, gross, including the Mirador and Guadalupe formations). The Llanos 34 block represented 95% of GeoPark Colombia 2P D&M certified reserves as of December 31, 2018. In November 2018, GeoPark signed an agreement with Perenco Oil and Gas to divest the La Cuerva and Yamu blocks for $18 million plus a contingent payment of $2 million based on future oil prices. GeoPark will continue operating the La Cuerva and Yamu blocks until the closing of this transaction, expected in the first months of 2019. Reserves corresponding to the La Cuerva and Yamu blocks include 2.3 mmboe of 1P (1.1 mmboe PD and 1.2 mmboe PUD), 5.3 mmboe of 2P and 7.9 mmboe of 3P reserves as of December 31, 2018. GeoPark completed the preparation of the Environmental Impact Assessment (EIA) to initiate operations in the Situche Central oil field in the Morona block (GeoPark operated, 75% WI). The EIA was submitted to the Servicio Nacional de Certificacion Ambiental (SENACE) on July 2, 2018. The Company is currently waiting for additional comments from SENACE, which is the final step of the EIA approval process. During 2018, D&M updated its review of the Situche Central field, including a reinterpretation of the 3D seismic, structural geology, trapping and oil migration model. Following this evaluation, D&M has certified 3P gross reserves of 198.3 mmbbl in the Situche Central field (131.2 mmbbl net to GeoPark), which represents a 111% increase with respect to the 2017 reserve certification, and provides more information with respect to the field size and significant upside potential. The Situche Central oil field in the Morona block represented 100% of GeoPark’s Peruvian D&M certified reserves. GeoPark’s 2P D&M certified reserves in Chile decreased by 27% to 24.7 mmboe compared to 2017. Oil and gas production, adjusted development plans and other technical revisions caused the declines, which were partially offset by drilling successes. The 1P RLI was 7.2 years (no change from 2017). The 2P RLI decreased to 24.7 years, compared to 30.7 years in 2017. The Fell block represented 99% of GeoPark Chile 2P D&M certified reserves and consisted of 40% oil and 60% gas, similar to 2017. After production of 0.7 mmboe in 2018, GeoPark’s 2P D&M certified reserves in Argentina increased significantly to 14.2 mmboe compared to 1.1 mmboe in 2017. The net increase in 2018 includes the acquisition of 100% WI and operatorship of the Aguada Baguales, El Porvenir and Puesto Touquet blocks. The 1P RLI and 2P RLI increased to 6.1 years and 15.2 years, respectively. The Aguada Baguales, El Porvenir and Puesto Touquet blocks represented 91% of GeoPark Argentina 2P D&M certified reserves and consisted of 42% oil and 58% gas. GeoPark’s 2P D&M certified reserves in Brazil decreased by 27% to 3.2 mmboe compared to 2017, resulting from production of 1.1 mmboe during 2018. The 2P RLI decreased to 2.9 years compared to 4.0 years in 2017. The Manati field (GeoPark non-operated, 10% WI) represented 100% of GeoPark’s Brazilian D&M certified reserves and is 98% gas.